Twice a year our family drags traditional Lenape clothes out of mothballs and makes tracks to Delaware (Lenape Indian Nation) Powwows. Our first stop Memorial weekend in May is to Copan, Oklahoma for those tribal members who were forced to move west and the second trek is to Forksville, Pennsylvania for the “stay behind people”. Our family is on the tribal registration rolls of the Eastern Delaware Nation in Pennsylvania. We have been making the Oklahoma event for twenty six years and the Pennsylvania gathering for four years. 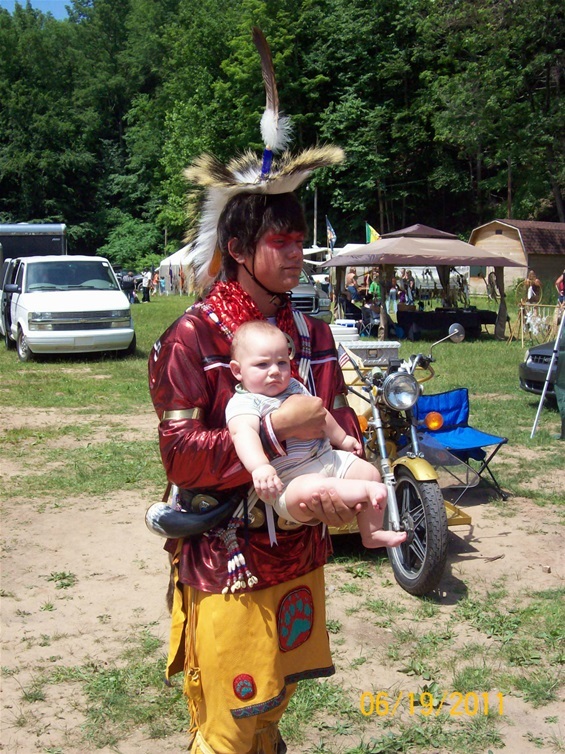 Daniel attended his first Delaware Powwow in Oklahoma confined to his portable crib. Night drums and Indian songs, Way, heya hay, wah ah ha way ah…were his favorite lullabies. His German Mother became an expert Lenape moccasin maker and sewed his traditional straight dance clothes with the deer skins provided by his Lenape Father. His Mother would have chosen moccasin making as a profession to replace her work as a Mathematics Professor if an adequate market for Lenape moccasins could have been found. With the death of his mother, Daniel’s Dad took on the moccasin maker role and his Sister became his powwow dance clothes designer for a growing young man now over six foot tall. These two trips each year are not enough dancing for Daniel. He travels alone to any powwow within half a day’s driving time from his State University of New York Fredonia (FRED) dorm room. Sometimes he travels alone and sometimes he takes another FRED student with him to these powwows. Like Lenape warriors of the past, Daniel adventures into the unknown forest to unexplored gatherings of Native peoples for traditional dances listed on many Indian websites of the internet. His search for opportunities to morph into his Lenape heritage and dance is sometime unsettling, even scary for his father. On one hand, it is with pride his Dad, as a single parent, seeing his son placing great value on their Lenape family heritage as a confident straight dancer. There is pride in an independent son who identifies as Indian finding a need to do traditional, spiritual dancing. His self-reliance and adventuresome travels are to be commended. Father and family surprised him to join in the dancing. Some of the American Indian dances and dancers are different, even strange to his family and their expectations of powwow events. At Clearfield, they were treated to dance men in dyed long johns, a new contemporary Indian dance category called the chicken dancers. Daniel arrived in Perryopolis, Pennsylvania. “There were only a few traditional dancers at this powwow, maybe eight. The lack of dancers could have been because the organizers moved the location without much notification or even a visible sign at the old site. The Ranger didn’t even know anything about the event. The powwow M.C. called for two step leaders. No leaders volunteered to lead the two- step dance. Dan and random lady elder were selected to dance as leaders. The dance went reasonable well with the few people attending. It was the first time Daniel had ever led the two-step dance although he had danced it many times even as a child in Oklahoma. Then the M.C. asked Dan to lead a sneak up dance. As a family, we do not do the sneak up dance often. This powwow had a second sneak up/Buffalo Dance just a little different. The M.C. asked for a small child volunteer? No child attending volunteered to help the announcer. An elder woman was volunteered and entered the dance arena. They placed her on a blanket. Someone with an expensive camera the kind news photographers use came into the arena and positioned dancers around the buffalo like they were killing it for pictures. The M.C. covered the woman and called for a drum song as the dancers circled the scene. The dancers were instructed by the photographer to “kill the buffalo”. She was carried out or the arena on the blanket by the dancers like they had made a kill. This was just a bit too unreal for Daniel and not like any other powwow he had attended. It was time to head back to the SUNY Fredonia college campus. Maybe he would find another powwow another day that was a bit more familiar. Who is the baby with Daniel? Daniel was soooooo happy on that day taking the pictures with the baby.